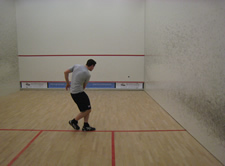 The problem with drops in racketball is that if there hit badly they can easily sit up at the front of the court. The drive kill can be an effective way to move the ball to the front of the court without the worry of the ball sitting up and your opponent hitting an easy winner on you. I hit this shot with a very similar technique to the drop shot. I use the edge of the racket, the same as the straight drop, but with as much pace as I can feel comfortable with. You want to aim low, maybe only an inch above the tin and for the ball to then hit the front wall and then floor before touching and running alongside the side wall. 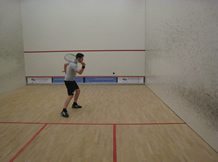 It’s very difficult to get the racketball to stay in the nick especially if you don’t have a good angle and as you’re hitting the ball hard if you miss the nick then the ball is likely to come out away from the wall and into the middle of the court, giving all the momentum back to your opponent. If you aim to hit the front wall then the floor and for the ball to then clip and run along the side wall you are unlikely to give away your control of the rally and if you hit the ball well it could be a winner. The photos below shows the shot in action. It’s still a short swing, with plenty of cut and a good follow through but racket head speed is key, you want the ball to move as quickly as possible to the front wall to give you the best chance of hitting a winner, this is not just a fast drop shot. ou might think the objective of the shot is to hit a winner to the front like the drop but with the kill you shouldn’t really be looking to make the ball bounce twice. If it’s tight enough it will count as a winner no matter where it is. Your objective should be to hit the ball low so that even if you don’t manage to get the ball tight all your opponent will be able to do is hit the ball up onto the front wall allowing you to keep control of the rally. This can be a really effective shot on the backhand as well as the forehand but it’s all about racket speed, if you feel you can’t get enough see my article on backhand racket head speed which will be up in two weeks time.